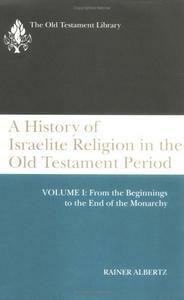 Rainer Albertz, "A History of Israelite Religion in the Old Testament Period, Vol. 1: From the Beginnings to the End of the Monarchy"
This comprehensive history of Israel and Judah from the earliest discernible beginnings to Hellenistic times chronicles these kingdoms, not only in light of the religions of the ancient Near East but also in light of what we can recover of Israelite social history. Albertz describes the history of Israel's religion as an interplay between historical demands, religious experiences, and theological reactions as different groups struggle over the appropriate religious response to God and the social practice that needs to go with it. Albertz's work brings together archaeological, historical, social, literary, and religious information, thereby illuminating Israel's religious practices and also giving the reader a stimulating survey of the whole of Old Testament research today.